Endocytosis and exocytosis are two mechanisms involved in the transport of matter through the lipid bilayer. 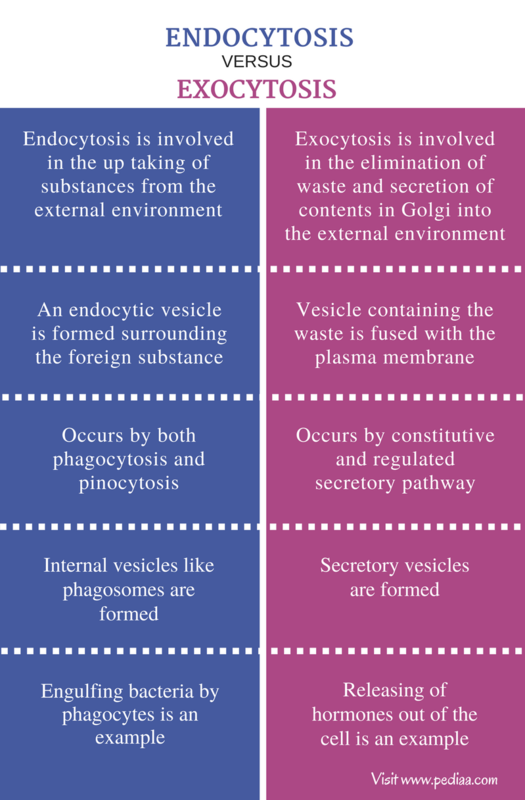 Both endocytosis and exocytosis occur through the formation of vesicles. Eukaryotic cells ingest particles and macromolecules into the cell by endocytosis. Phagocytosis and pinocytosis are the major mechanisms, involved in endocytosis. Phagocytosis of pathogens leads to the defense of the host. The content in Golgi apparatus is secreted to the extracellular environment by exocytosis. The toxic material and other unwanted things are eliminated from the cell by exocytosis as well. The main difference between endocytosis and exocytosis is that endocytosis refers to taking in matter to the cell from external environment whereas exocytosis refers to exporting material out of the Golgi complex via secretory vesicles into the external environment. Endocytosis is the taking in of matter into a living cell by invagination of the cell membrane, forming a vacuole. This vacuole is called endocytic vacuole. The internalized material is surrounded by an area of the plasma membrane in the endocytic vacuole. Two types of endocytosis are identified: ingestion of solid particles and the ingestion of fluids with its solutes. The ingestion of solid particles is called phagocytosis, and the ingestion of fluids with its solutes is called pinocytosis. Phagocytosis is also called cell eating in unicellular eukaryotes like amoeba. 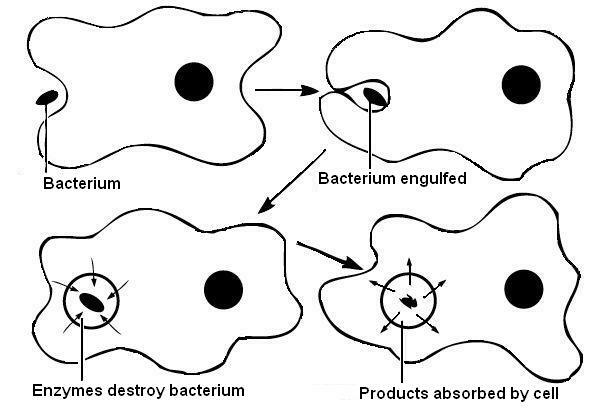 Amoebautilizes phagocytosis in order to engulf food particles. In higher eukaryotes, phagocytosis is carried out by specialized phagocytes by engulfing either cell debris, bacteria, viruses or even intact cells. The binding of particles with the receptors on the plasma membrane will initiate the process by forming pseudopodia, surrounding the particle. These pseudopodia are generated by the actin-based movements of the cell surface. The forming vesicle is called phagosome. The phagosome is dragged to a lysosome. The fusion of lysosome with phagosome forms the phagolysosome. By the action of hydrolytic enzymes in the lysosome, the ingested material is digested. The destroying of foreign pathogens like bacteria and viruses in multicellular organisms by phagocytosis is involved in the defense of the organism. Macrophages and neutrophils are considered as professional phagocytes. Receptor-mediated endocytosis occurs in pinocytosis, where fluids are taken up by the cell along with the dissolved solutes. Clathrin-coated pits are the areas containing concentrated receptors on the plasma membrane. Specific receptors in these areas are bound with the macromolecules to be taken up. Pinocytosis is also called cell drinking. Exocytosis is the export of the material in the Golgi apparatus by secretory vesicles into the external environment. The material in the Golgi apparatus is exported to transport vesicles. These vesicles travel to the plasma membrane and, the contents of the vesicles are released to the external environment with the fusion of plasma membrane. Digestive enzymes and hormones are secreted out of the cell by exocytosis. Exocytosis is also involved in the elimination of waste from the cell. Two types of secretory pathways are involved in exocytosis: constitutive secretory pathway and regulated secretory pathway. Protein molecules in the Golgi apparatus, which are not tagged with signal peptides are secreted by the constitutive secretory pathway. The products, which are secreted out by the cell are stored in secretory vesicles. Since these vesicles contain a dense core, they are also called dense-core vesicles. Small molecules like histamine and proteins like hormones and digestive enzymes are the products secreted by cells. Proteins which are destined for the secretion are called secretory proteins. Once these secretory proteins are loaded into secretory vesicles, they undergo post translational modifications like the liberation of active molecules by proteolysis. The secretion can be activated by extracellular signals as well. This regulated exocytosis is called regulated secretory pathway. Histamine is secreted by mast cells, once a soluble stimulant called the ligand is bound to the receptors on the mast cells surface. Histamine leads to sneezing and itching, which are accompanied by allergic reactions. Neurotransmitters are also secreted by the regulated secretory pathway. Endocytosis: Endocytosis is involved in the up taking of substances from the external environment. Exocytosis: Exocytosis is involved in the elimination of waste and secretion of contents in Golgi into the external environment. Endocytosis: During endocytosis, an endocytic vesicle is formed surrounding the foreign substance, which is either a solid or a liquid. Exocytosis: During exocytosis, the vesicle containing the waste is fused with the plasma membrane in order to eliminate its contents. Endocytosis: Endocytosis occurs by both phagocytosis and pinocytosis. Exocytosis: Exocytosis occurs by constitutive and regulated secretory pathways. Endocytosis: Internal vesicles like phagosomes are formed during endocytosis. Exocytosis: Secretory vesicles are formed during exocytosis. Endocytosis: Engulfing bacteria by phagocytes is an example for endocytosis. Exocytosis: Releasing of hormones out of the cell is an example for exocytosis. The movement of macromolecules like proteins and polysaccharides into or out of the cell is known as bulk transport. Two types of bulk transport are identified: exocytosis and endocytosis. Both these transport methods require energy in the form of ATP. Two mechanisms of endocytosis are found: phagocytosis and pinocytosis. During phagocytosis, solid particles like food particles, cell debris, dead cells and extracellular pathogens are taken up into the cell by forming an endocytic vesicle called phagosome. Since extracellular pathogens like bacteria and viruses can be destroyed by phagocytes, phagocytosis is considered to be involved in the innate immunity during the host defense. Pinocytosis is the taking up fluids along with the dissolved solutes. By pinocytosis, cells are capable of taking up nutrients into the cell. Exocytosis occurs by either constitutive secretory pathway or regulated secretory pathway. 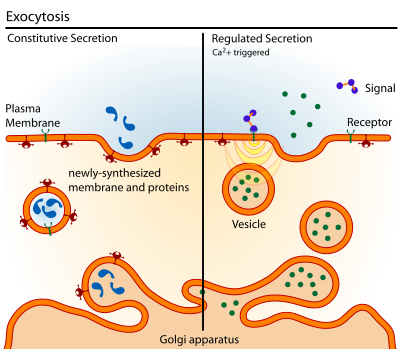 During constitutive secretory pathway, the contents of the Golgi, which are not tagged by signal peptides are transported out of the cell by loading into secretory vesicles. During the regulated secretory pathway, contents in the secretory vesicles are released according to the signals obtained from the extracellular environment. Exocytosis is also used in the elimination of waste products of the cell. Thus main difference between endocytosis and exocytosis is in the mechanism of the bulk transport. 1. Cooper, Geoffrey M. “Endocytosis.” The Cell: A Molecular Approach. 2nd edition. U.S. National Library of Medicine, 01 Jan. 1970. Web. 22 Apr. 2017. 2. Alberts, Bruce. “Transport from the Trans Golgi Network to the Cell Exterior: Exocytosis.” Molecular Biology of the Cell. 4th edition. U.S. National Library of Medicine, 01 Jan. 1970. Web. 22 Apr. 2017.